Medicines shortages have become a complex global issue, putting lives at risk and creating difficulties for health care professionals. There is evidence that these shortages are worsening with time; in some countries, medicine shortages tripled between 2005 and 2010. The causes of these shortages are multidimensional in the context of a complex global supply chain. As a result, there is a growing concern among health care professionals about the future of medicines availability worldwide. Each country should establish a publicly accessible means of providing information on medicine shortages. A global process to determine the list of critical/vulnerable products should be developed. All procurers of medicines are urged to move towards active procurement processes that assure the continuity of supply of quality medicines. All countries are encouraged to remove unnecessary variability of regulatory practices within and between countries. All countries should investigate the potential to establish a national body charged with gathering and sharing information about demand for, and supply of, medicines within their jurisdiction. All countries are encouraged to develop evidence-based risk mitigation strategies which might include strategic buffer stockpiles, contingency plans, pandemic planning and capacity redundancy, appropriate to their national needs. FIP has been pleased to see that these recommendations were aligned with the 2016 World Health Assembly resolution “Addressing the global shortage of medicines and vaccines ” (69.25). There are many definitions of “medicines shortages”. FIP has defined it as: “A drug supply issue requiring a change. It impacts patient care and requires the use of an alternative agent”. This was included in the WHO compiled list of “medicines shortages” definitions. In late 2016, the WHO invited FIP to provide expertise to the drafted technical definition of medicines and vaccines shortages. FIP has taken an active role in raising awareness of medicine shortages in recent years. We have given statements on addressing the global shortage of medicines and vaccines at the WHO Executive Board meetings in 2014, 2016, 2017 and 2018, and at the World Health Assembly in 2018. In these statements, FIP has reflected its commitment to finding solutions to tackle medicines shortages, to raise awareness of their impact, to improve access and to help implement the WHO resolution 69.25 on medicines shortages. In December 2015, FIP financially and technically supported the WHO Technical Consultation on Preventing and Managing Global Stock Outs of Medicines event, where an overview on the current medicines shortages situation was presented. In May 2017 FIP released an overview of eight models used in Australia, Canada, Netherlands, Slovakia, South Africa and the USA for reporting medicines shortages. This document aims to support the implementation of the WHA Resolution 69.25. 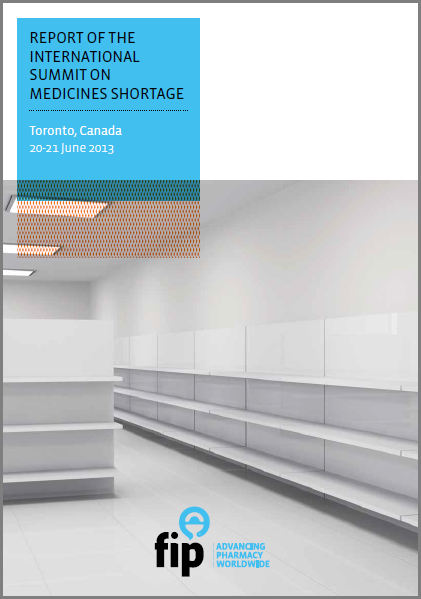 In a number of countries, shortage reporting systems are being implemented by national associations of pharmacists.